The latest addition to its heritage collection, the Longines Avigation BigEye wins the “Revival” prize at the 2017 ceremony of the Grand Prix de l’Horlogerie de Genève. This model of the Heritage line is a reinterpretation of a chronograph with a design from the 1930es, with reference to vintage pilot watches. 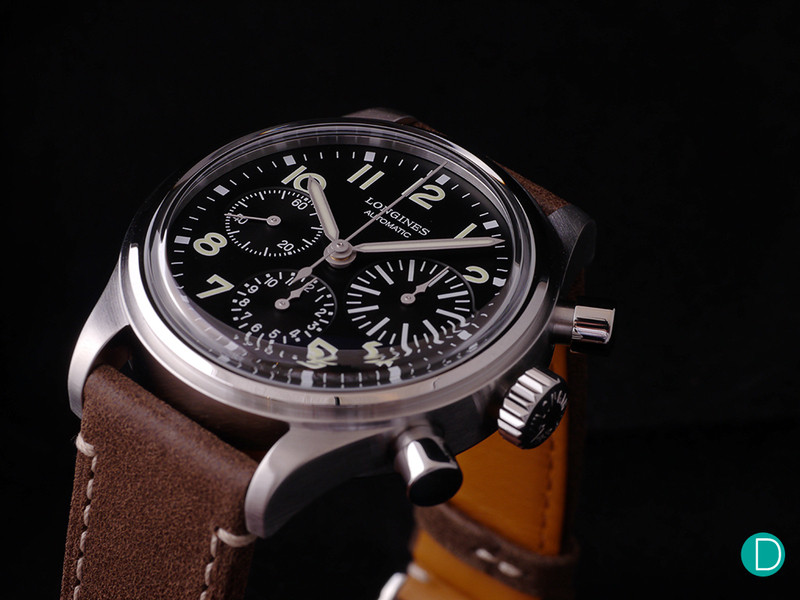 The Longines Avigation BigEye is inspired by vintage aviation type chronograph. Congruous with the design aesthetics of pilots’ watches, the dial is highly readable, with large font hour markers, and the pushers are sized larger than on classic timepieces. This is to enable the wearer to handle them while wearing gloves. The pushers are made larger than on the usual pump pusher chronographs, alluding to the pilots’ watch style, designed for buttons to be operated by gloved hands. 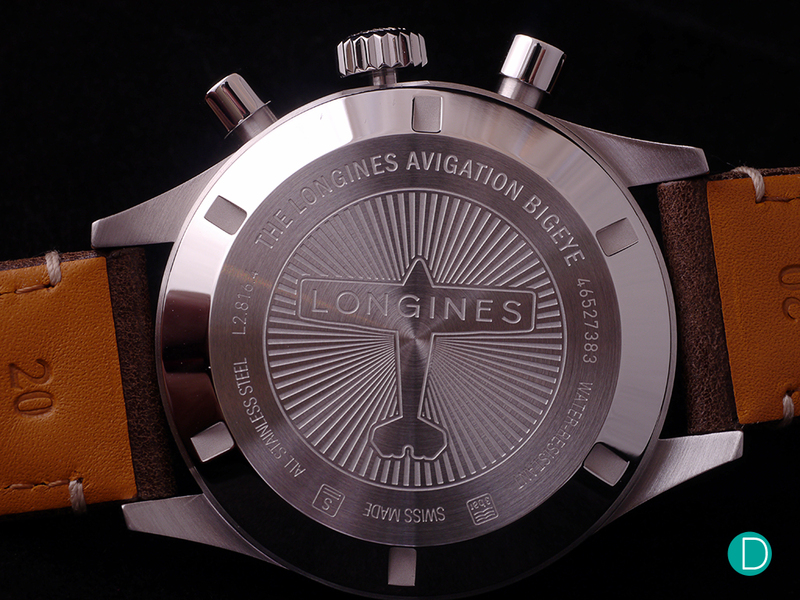 The dial is decorated with Arabic numerals coated with SuperLuminova©. Its semi-glossy black dial is decorated with Arabic numerals coated with SuperLuminova©, and displays a small second hand at 9 o’clock as well as a 12-hour counter at 6 o’clock. The oversized 30-minute counter at 3 o’clock throws off the traditional symmetry of a chronograph dial, but can be interpreted as adding a touch of creativity to the otherwise all classic design. The side view reveals a rather thick case, a tradeoff for a self-winding movement as compared to the manual winding movements of the past. The stainless steel case measures 41 mm in diameter and is water resistant to 30 meters. It is fit with a domed sapphire crystal glass with several layers of anti-reflective coating. To complete the look, a nubuck texture leather strap is used. The case finish is military inspired, with a brushed finish along the center case and a polished thin step bezel. The lugs look raw and straightforward, which is in line with the overall design aesthetic. A closed screw-down caseback is used. 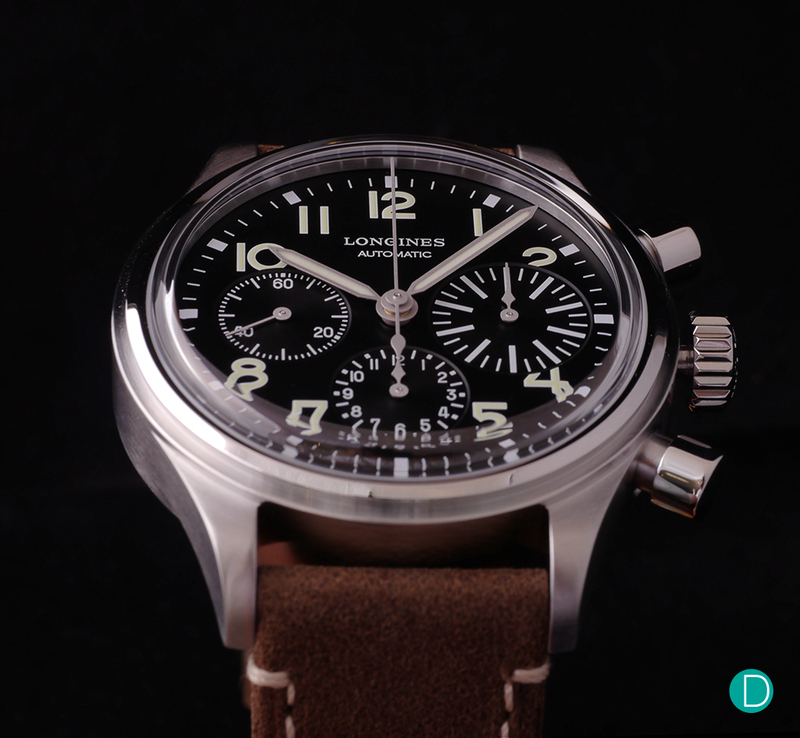 The Longines Avigation Bigeye uses the Longines caliber L688 column wheel chronograph. 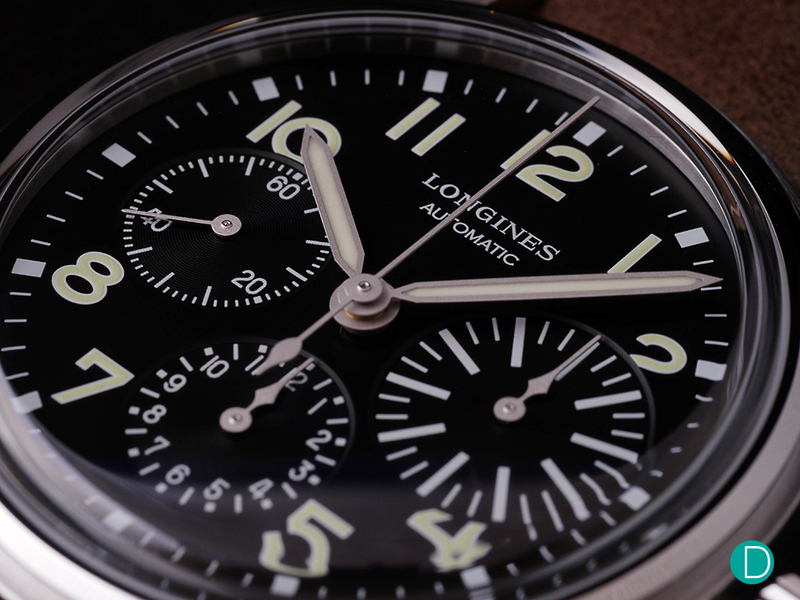 Longines has a long history in watchmaking innovation. 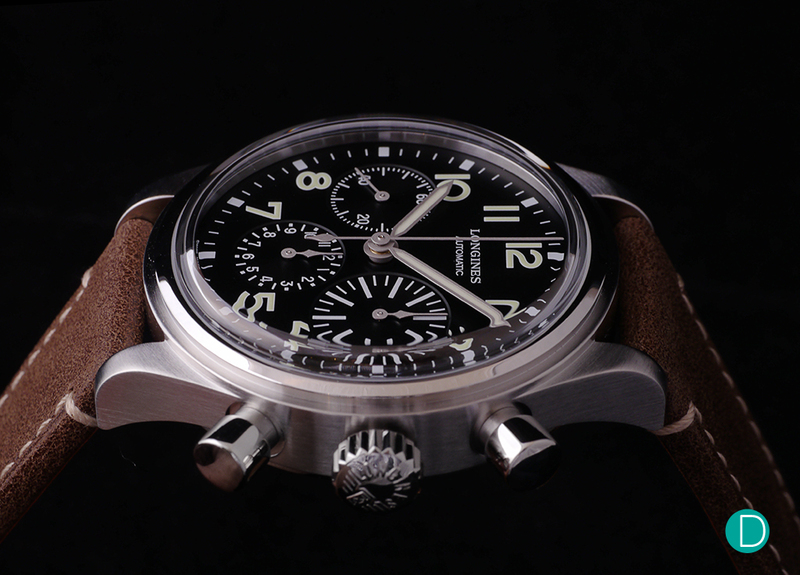 They hold the patent of the flyback chronograph and have produced several notable mechanical chronographs. But of concern of us today, is the column wheel chronograph which they produced the world’s first in 1878. 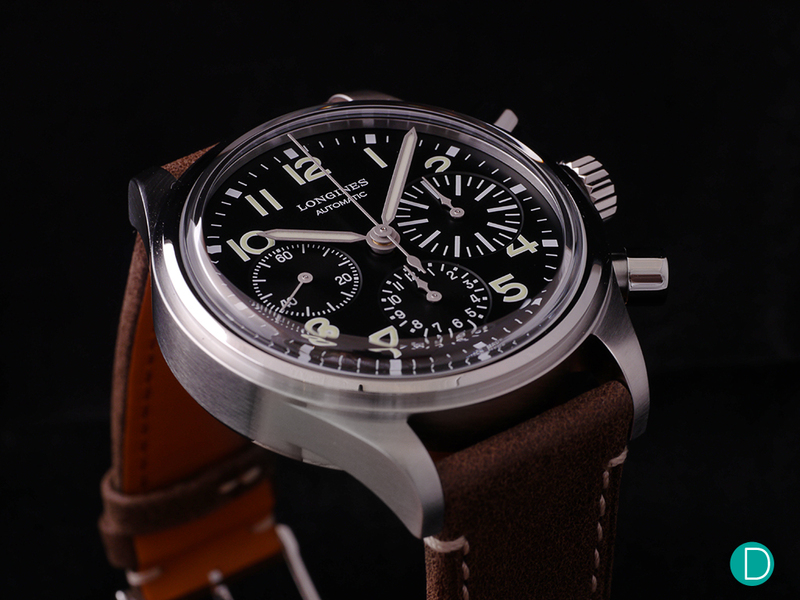 In 2011, Longines added the L688 column wheel chronograph to the Heritage collection. The movement is still used in the collection today, as with this Avigation Bigeye. The movement is roughly based off the Valjoux 7750 and bears its thickness, made distinct by watch case profiles which house the movements. That said, the column wheel chronograph is a bargain by today’s market standards, price-wise it’s packed between notable movements like the Japanese-made Seiko chronograph movement (used in TagHeuer) and the Swiss-made Zenith El Primero. Performance wise, the movement is robust and time tested, a practical automatic caliber with 54 hours of power reserve. 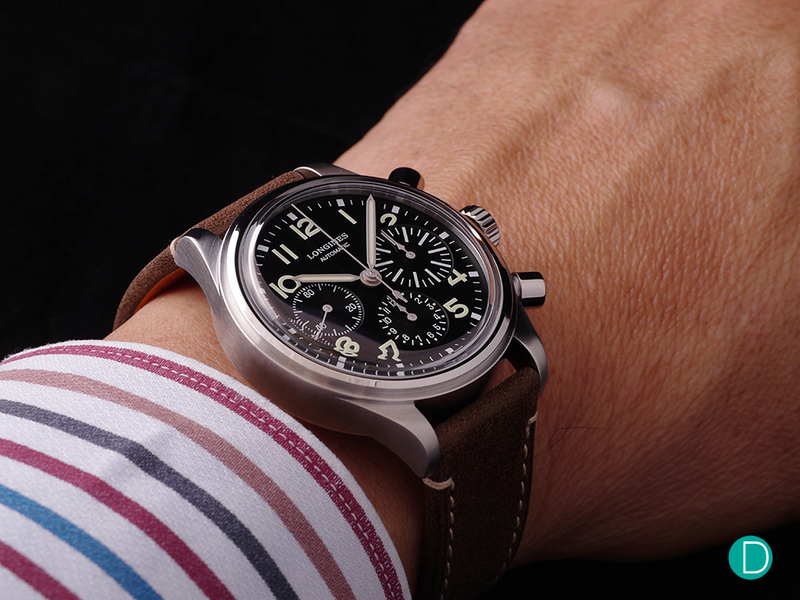 The Longines Avigation Bigeye on the wrist. Overall, the watch is well-designed and a welcome addition to the Heritage line. The case, dial and movement are ideal and in an almost formulaic fashion, the watch ticks all major requirements. At S$3980, the watch is priced competitively and goes head to head with its competitor Tudor; which employs similar product type offerings. As for us, we like the watch. It looks good and is a good addition to any collection. Then again, whether the market is starting to get ‘retro’ fatigue is another story altogether. Chronograph: Central 60 seconds hand, 30 minutes counter at 3 o’clock, 12 hours counter at 6 o’clock. Main Functions: Hours, minutes, small seconds at 9 o’clock and date.